Burlingame opponents, from left, Joe Edwards, Dwight Shellman, Junee Kirk and Bert Myrin prepare for a news conference at GrassRoots TV on Wednesday. Aspen Times photo/Paul Conrad. 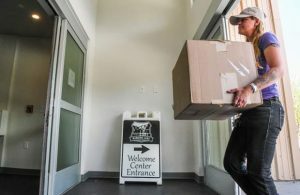 Two housing questions slated for Aspen’s May 3 election won’t be removed from the ballot, and ringleaders of the group that brought the measures forward blasted the City Council on Wednesday for suggesting it.Former Pitkin County Commissioners Dwight Shellman and Joe Edwards, opponents of the city’s planned Burlingame Ranch affordable housing project, convened a news conference Wednesday on GrassRoots TV to confirm they have no intention of withdrawing the citizen-initiated questions that the council has already agreed to place on the ballot. 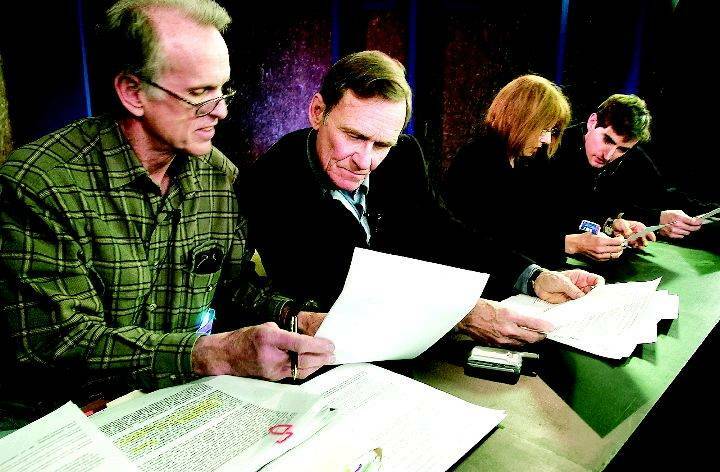 They, along with petition circulators Junee Kirk and Bert Myrin, also used the forum on live television to level a host of charges against the council regarding the controversial housing project and allege abuses in the worker housing program, portending a spirited campaign season.With the two initiative questions aimed at preventing what Shellman called “Burlingame-type abuses” already on the ballot, he urged the council to poll voters on the annexation of land for the housing project.The council members hinted this week they’d be willing to ask voters to either uphold or reject the annexation if the backers of the two initiatives would withdraw those measures.Roughly 1,000 people signed each initiative and Shellman said it would be inappropriate to pull them off the ballot. “We’ve got a thousand people who said they like these ordinances and they want them adopted,” Edwards said.In addition, the city removed a provision from its charter two years ago that allowed for the withdrawal of initiative petitions, he noted. The charter is now mute on the subject.The two ordinances proposed through the initiatives would establish new policies governing the development of city-subsidized housing. Shellman blasted the council for resisting voter oversight of Burlingame and suggested the city put a referendum on the ballot that lets voters make the call on what he called “an incredibly bad annexation deal.”A resolution that would place the referendum on the ballot is being drafted for the council’s consideration on March 14, Mayor Helen Klanderud said.”We certainly will have a discussion about it,” she said. Burlingame opponents – many of the same individuals who circulated the initiatives – are now circulating a referendum petition that would ask voters to repeal the annexation of the Bar/X Ranch, which encompasses land slated for the Burlingame housing. The circulators are close to having sufficient signatures to submit the petition to the city and the council should simply put the matter on the ballot, Shellman said.At issue is a matter of timing. The council can act in time to put the referendum before voters at the regular city election in May; the petition process would likely mean a special election this summer.There is a good argument for letting voters decide in May, Klanderud conceded.”The earlier we know the status of Burlingame moving forward, the better,” she said.Muddying the waters is an ongoing protest period that could put the fate of the two initiative ordinances in question. Either or both of the petitions can be challenged until March 16. A challenge could result in the two questions being pulled from the ballot while a hearing is conducted. In the meantime, if voters approved the annexation of the Bar/X on May 3, Burlingame might move forward unaffected by the proposed initiative ordinances, though the measures could affect future projects, if they are ultimately adopted. “The impacts on future planning for affordable housing is seriously hindered, should these petitions pass,” Klanderud said.One initiative would force public votes on many future housing projects; the other would prevent the city from entering into annexation deals like the one it struck with the Zoline family, owners of the Bar/X. The preannexation agreement with the Zolines outlined plans for Burlingame and a free-market development on the Bar/X.Had the city let the Zolines go through the land-use process on their own, the community would have gotten “real affordable housing” – the lower-priced units planned at Burlingame – as mitigation without taxpayer subsidy, Shellman contends. He called the higher-priced units planned at Burlingame housing for “the managerial class and trust-fund babies.”Edwards blasted the city for installing a road and infrastructure to the Burlingame site before the project’s approvals were in place and said worker housing should be provided in smaller projects mixed into the community. “Better not to ghetto-ize employees in their own little town of a thousand people on the edge of town,” he said. “It’s a bad project in the wrong place.”The remark set off Commissioner Mick Ireland, who heard Edwards’ comment in a radio news report.